Ask any journal editor to name their top three pain points and you will frequently hear "finding reviewers". With researchers so busy and the number of journal submissions on the rise, it is a common challenge for the editor community. 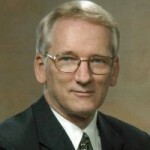 Edward H Shortliffe, MD, PhD, is Professor of Biomedical Informatics at Arizona State University in Phoenix, USA. 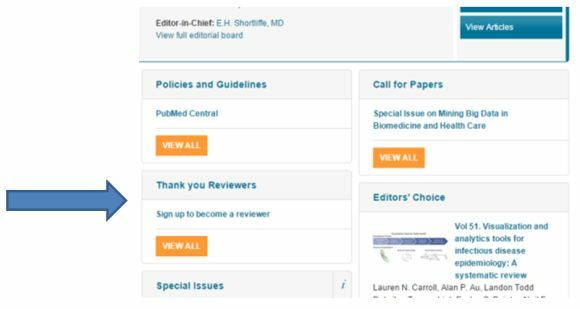 In his role as Editor-in-Chief of the Journal of Biomedical Informatics, he has come up with a simple yet novel approach to solving the problem; researchers interested in reviewing for the journal are invited to fill in this form on the journal homepage. Here he outlines the origins of the initiative and his observations since the form’s introduction. When I became Editor-in-Chief of Journal of Biomedical Informatics (JBI) around 14 years ago, I began receiving email messages from people interested in reviewing for the journal. As is true for every journal, sometimes we struggle not only to source enough reviewers, but to find people with the correct areas of expertise to review the research we publish. Some of the people who volunteered were clearly extremely knowledgeable in their field, but that field was outside the scope of our journal. In other cases I would receive emails with hardly any information – which meant I had to contact the sender to request more details – or need to deal with other emails that would be pages long. I realized that by creating a form with a standard set of questions, we could both formalize and simplify the volunteer process. 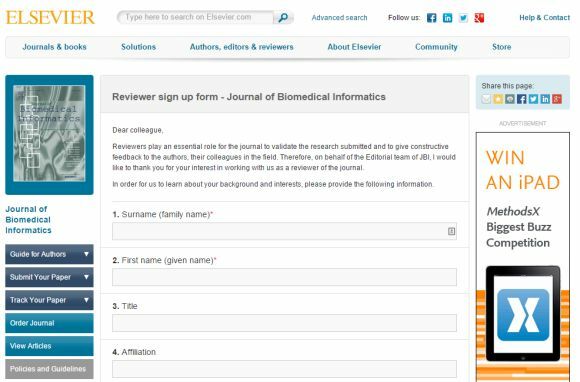 People visiting the Elsevier.com homepage of Journal of Biomedical Informatics see a link inviting them to volunteer as a reviewer. Those clicking on the link are taken through to the form below. It contains a range of questions, the answers to which help Professor Shortliffe to decide whether the researcher is a suitable reviewer candidate. As well as the usual information – name and contact details – I ask them for a short bio and their publishing and reviewing history. The question I find especially useful is “What is your motivation to review for JBI?”. It helps me to assess whether they have a clear understanding of the journal’s aims and scope. The way someone fills in the form also tells me a lot about them. If it has been completed in a slipshod manner I can see they wouldn’t be the kind of reviewer JBI is looking for. Interestingly, I have found that around 90 percent of the people asking to review for the journal are Asian postdocs in the US. The papers we publish tend to be concerned with information technology rather than medical devices, and to focus on underlying methods rather than applied system descriptions or summative evaluations. However, a number of those who apply to review are concerned with the biological end of the spectrum – I would love to get more people on the clinical end applying – and many of the volunteers are not really familiar with informatics at all. Having said that, I approve around 50 percent of the people who fill in the form. I simply send their details to the Journal Manager who adds them to our reviewer database and informs the individual. Whether they ever get asked by the editor to review is another matter and that is quite difficult to track. The form is not the only avenue we use to find new reviewers; all first authors of accepted papers are automatically added to our reviewer database, for example. Professor Edward H Shortliffe has been Editor-in-Chief of JBI since 2001, when the former Computers and Biomedical Research was reconstituted as the Journal of Biomedical Informatics. A physician with a PhD in computer science, he has research expertise in computer-based clinical decision support, knowledge representation, clinical systems, and the role of the internet in health care. He is Professor of Biomedical Informatics and Senior Advisor to the Executive Vice Provost for the College of Health Solutions at Arizona State University. Based for much of the year in New York City, he is a Scholar in Residence at the New York Academy of Medicine and holds academic positions as Adjunct Professor of Biomedical Informatics at Columbia University's College of Physicians and Surgeons and as Adjunct Professor of Health Policy and Research (Health Informatics) at Weill Cornell Medical College. Some volunteers are ambitious early career folks with less experience than one would prefer for referees. Motivation tends to be to pad their resumes as 'experts' recognized by a major journal. Some also may be seeking to bolster qualifications for U.S. residency status. However, such motivation is acceptable as long as their reviews are technically acceptable.